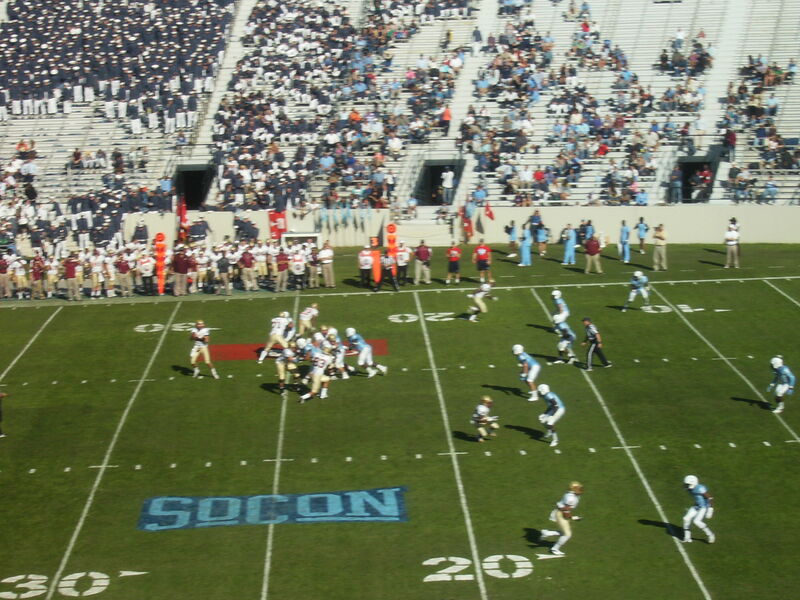 The Citadel 38, Elon 24. The weather was great, the atmosphere was festive, the tailgating was ridiculous, and the Bulldogs won on Homecoming. 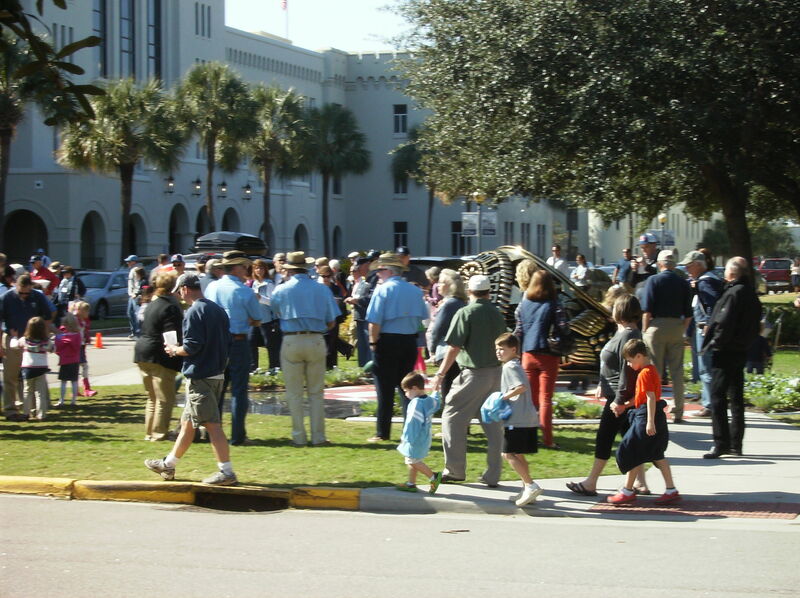 All in all, it was a very good day to be back at The Citadel. Was I worried when Elon crawled back from a 25-point deficit to get within a touchdown? Sure. 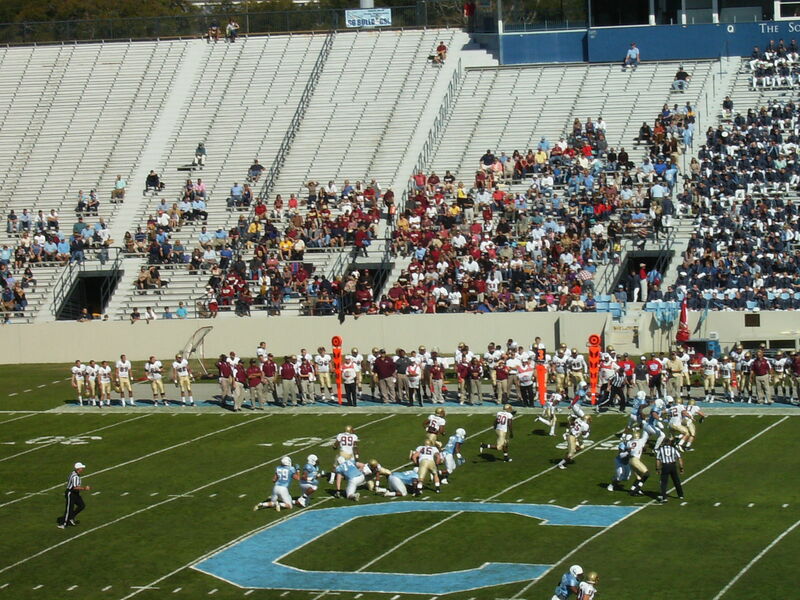 I definitely didn’t want to be in the stands to witness the biggest blown lead in The Citadel’s football history. Coach got his message across in no uncertain terms. He let us know, we had to establish ourselves on that drive. Heh…”in no uncertain terms.” Robinson certainly took the message to heart, carrying the ball nine times during the possession (which lasted over six minutes and featured nothing but running plays). He gained 54 of his 178 yards for the day on those nine rushes. Of the final ten plays on the drive, eight were runs by Robinson. The offensive line came to play at the end, too, especially Mike Sellers, who was taking names on a consistent basis. I was struck by how physical the game was, from both sides. It took its toll on some of the participants. Elon appeared to get the worst of things, most notably when Phoenix running back Karl Bostick was hurt on a rather brutal play in which he got bent over backwards while being tackled. Bostick’s injury was to his ankle and may have been season-ending, according to Elon coach Jason Swepson. I was afraid that might be the case when it happened. I think Elon’s players deserve some credit for not quitting after falling behind 31-6 early in the third quarter, especially after the way the first half ended. That had to have been as crushing a way to go into a locker room for the break as one could imagine. Swepson made a mistake managing the clock at the end of the half, and the Bulldogs took full advantage. Kevin Higgins could have let the half end, and no one would have criticized him, but he elected to run a play and see what would happen. 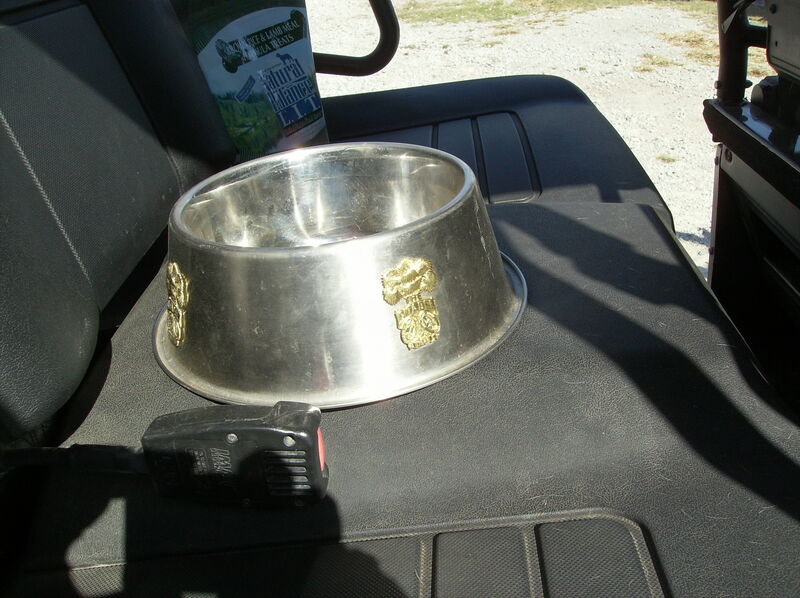 He made an intelligent call, the quarterback draw, and was rewarded. 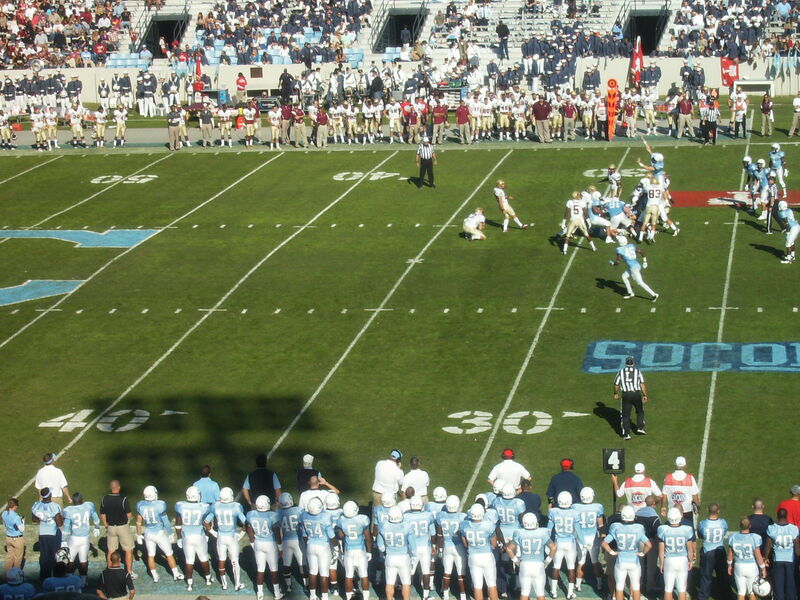 Three plays later, The Citadel would pull off a “Hail Mary”. 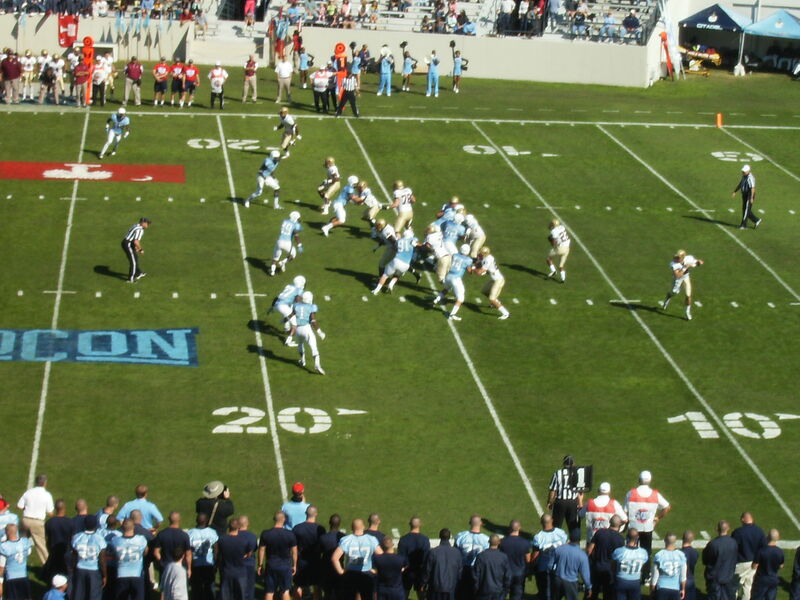 It’s the first time I’ve ever seen The Citadel connect on a Hail Mary in person. At least, I don’t recall another one. I do remember, however, seeing the Bulldogs score a touchdown on the final play of the first half at Johnson Hagood Stadium on one other occasion. That would have been November 28, 1992. 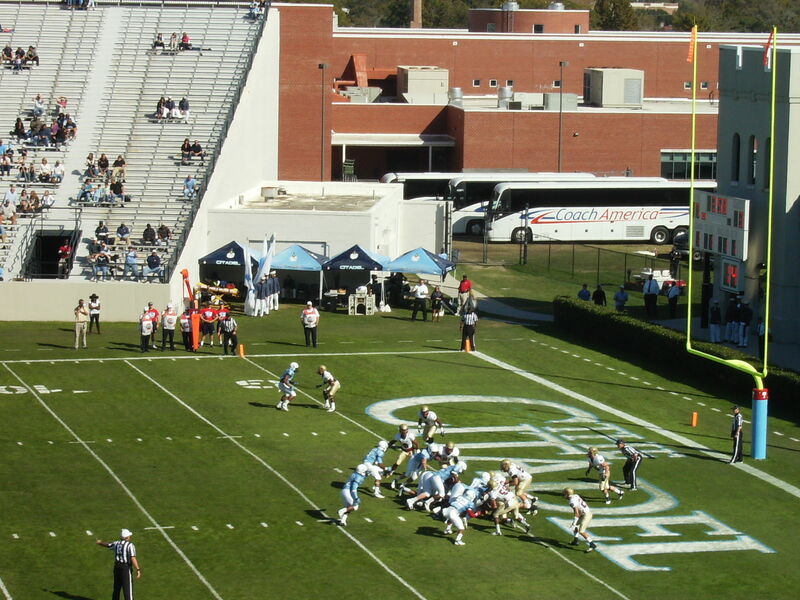 With seven seconds remaining in the first half, The Citadel led North Carolina A&T 13-0 in the first round of the I-AA playoffs. The Aggies had the ball and were inside the Bulldogs’ 30-yard-line, but Tracey Gamble sacked the A&T quarterback, who fumbled. Todd Lair picked up the loose pigskin and rumbled 65 yards for a TD. Having the presence of mind to turn and leap into the end zone may have been more impressive than the catch itself — and the catch was great. 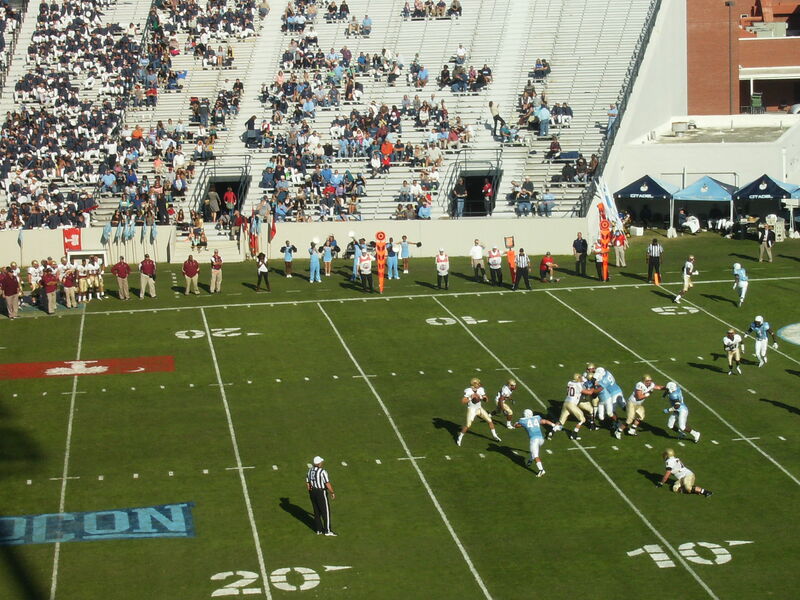 The crowd at Johnson Hagood was announced as 14,853. There was no official total to be had for the number of tailgaters, of course. I really don’t know how many people were tailgating who never entered the stadium. If I said at least 3,000, would that be an outrageous guess? Or would it be a conservative estimate? Oh, and the flyover was outstanding. 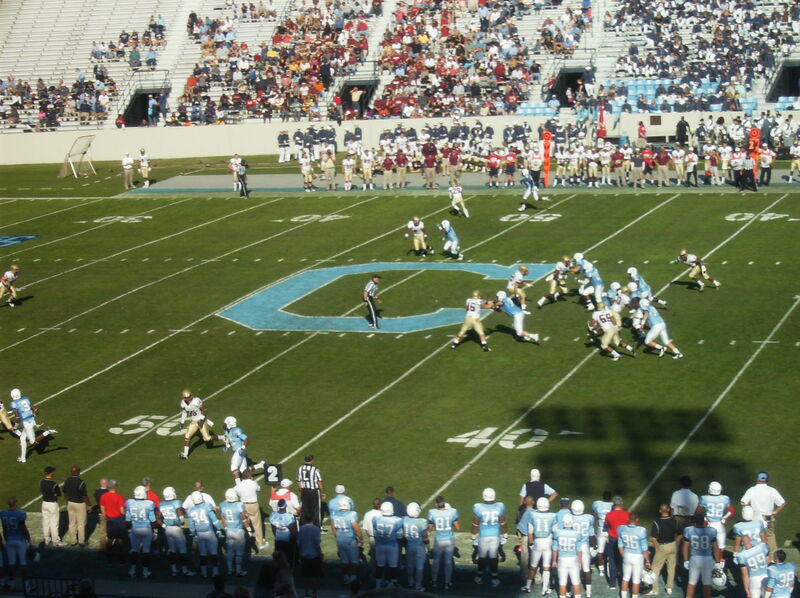 – The Citadel let Elon back into the game by unaccountably bogging down on offense in the second half. After scoring a TD on its opening drive of the stanza, the Bulldogs’ next four drives went like this: lost fumble, three-and-out, three-and-out, three-and-out. 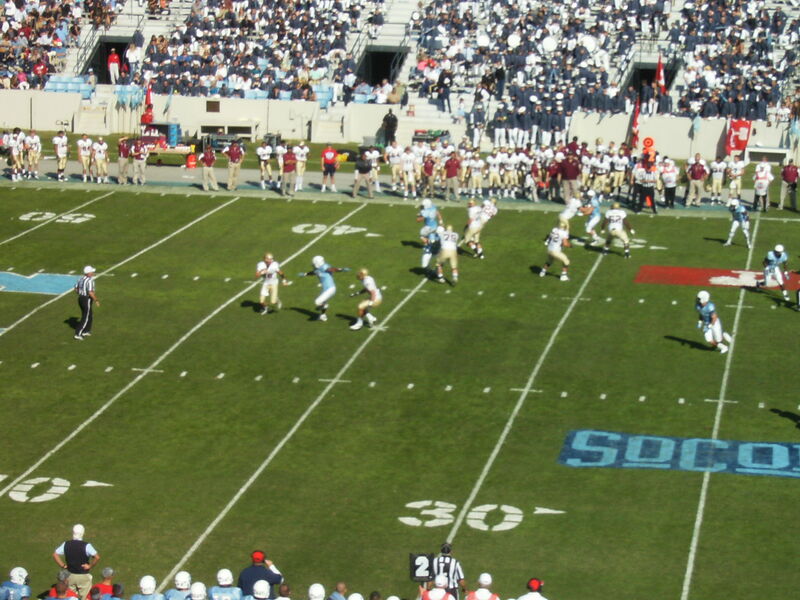 A better team may have made The Citadel pay for losing its offensive momentum. – The defense played well in the first half, but was also a bit lucky. Thomas Wilson failed to connect with Bostick on what would have been a TD pass on the Phoenix’s first possession. Later in the half, the Bulldogs blew a coverage, but Wilson overthrew Aaron Mellette, missing out on a long TD pass. – The Hail Mary disguised the fact that the rest of the Bulldogs’ passing game was suboptimal on Saturday. 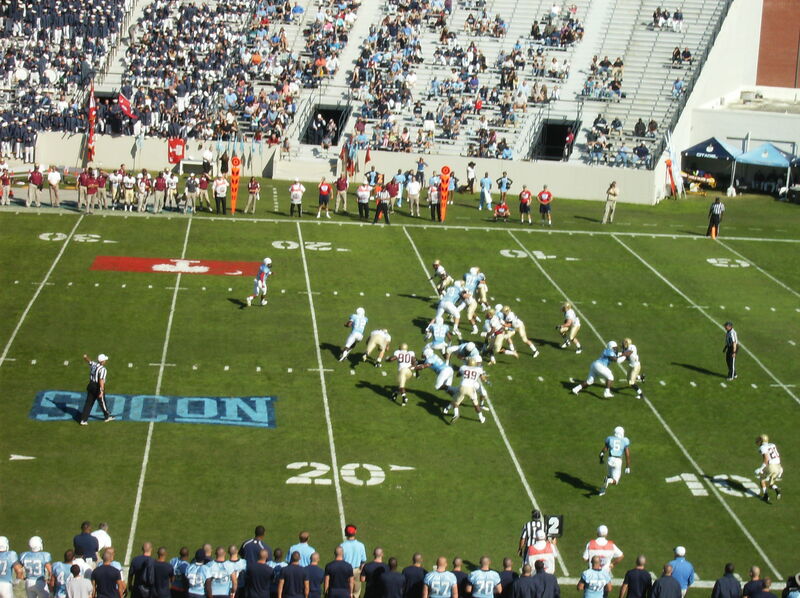 Aside from that one play, The Citadel was 1-9 passing for 15 yards. – I thought the Bulldogs’ timing on pitches seemed a little off at times on Saturday. 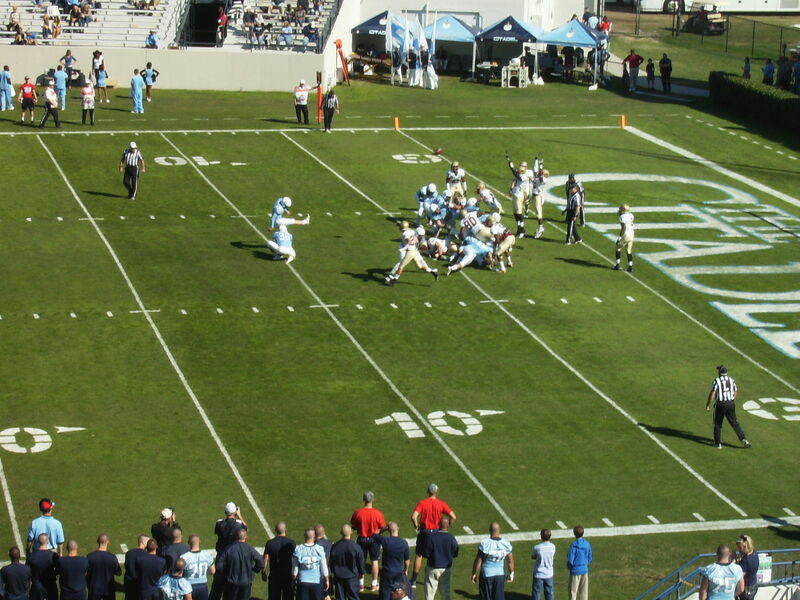 The Citadel lost a fumble on an errant pitch. Another semi-wayward toss was gathered in by Terrance Martin, who turned it into a rather nimble six-yard run. – Brandon McCladdie, for his outstanding coverage of Aaron Mellette, who had caught at least two touchdown passes in his previous six games. Mellette had no TDs on Saturday and had no truly big plays. 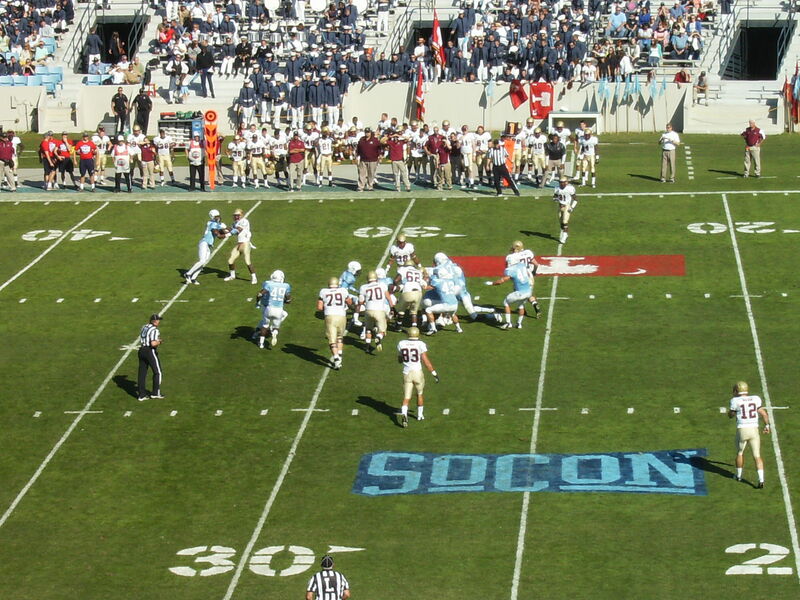 Best play I haven’t mentioned yet: Douglas German made a memorable special teams tackle on The Citadel’s final kickoff. I’m not sure what adjective to use to describe it. I think I’ll go with “sudden”. Now the Bulldogs are just one win away from clinching a winning season, which was the baseline goal entering the 2012 campaign. 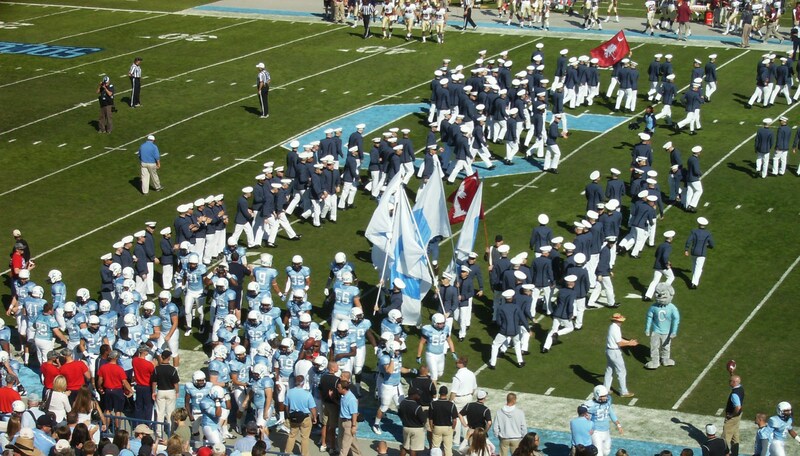 The first chance to get win #6 comes next Saturday at VMI, as The Citadel looks to retain the coveted Silver Shako. 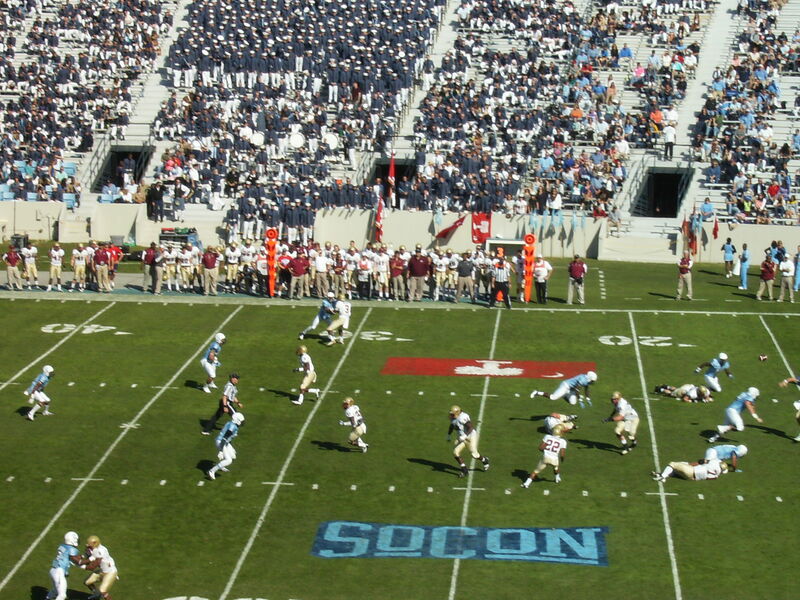 There is still a possibility the Bulldogs could sneak into the FCS playoffs with two more victories, although the other SoCon results from this weekend probably reduced the chances of that happening. At any rate, this is VMI week. There is no reason to concentrate on anything else. 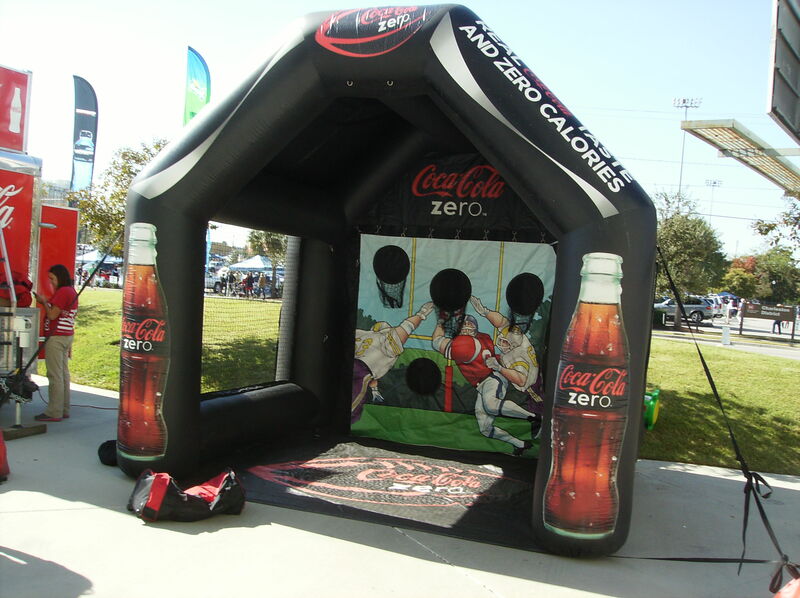 Below are photos from Saturday. I seem to be getting worse every week taking pictures. Most of the game action shots are from the first half, as I didn’t have much luck with the camera after halftime. 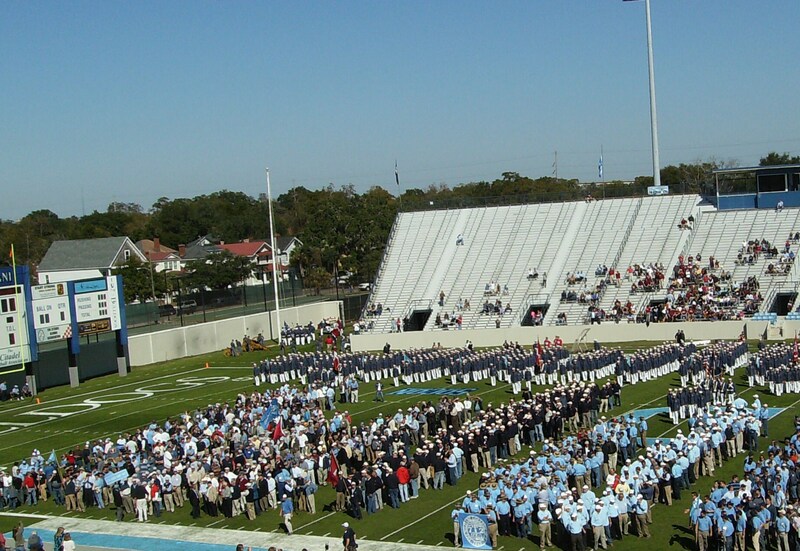 It’s Homecoming at The Citadel. 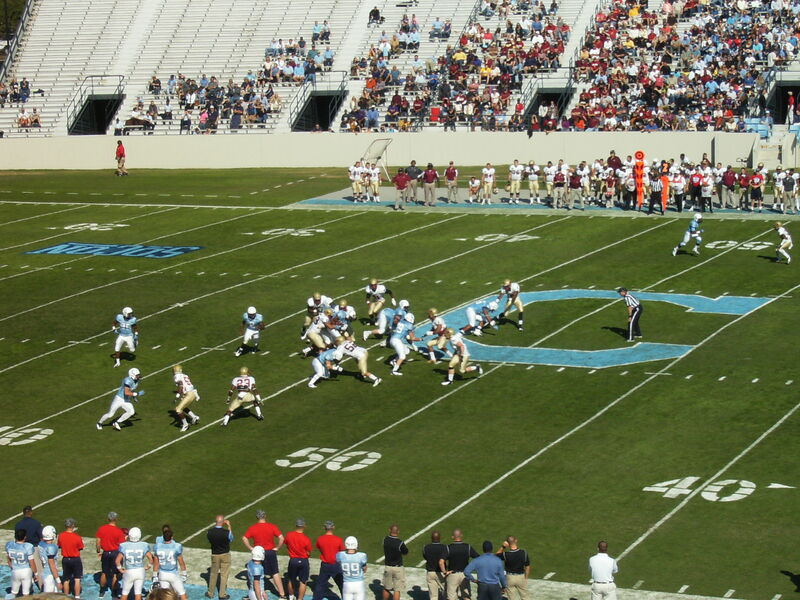 What can alums expect from the Bulldogs’ offense against Elon? 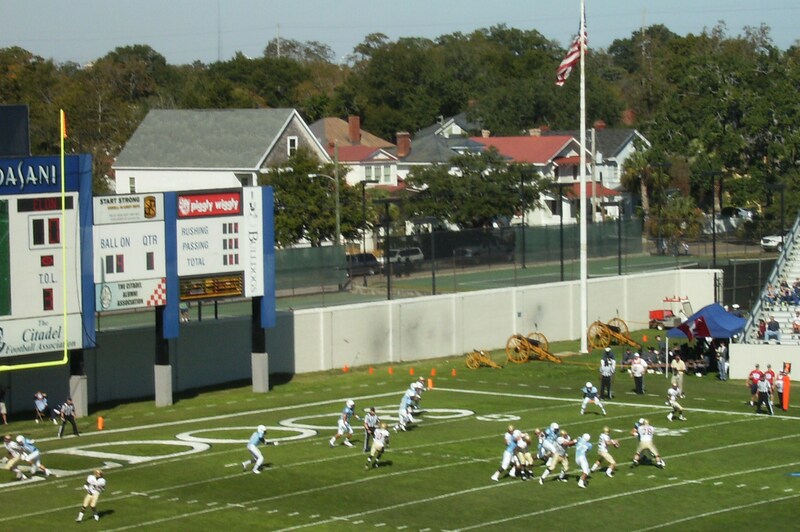 So, if things continue as they have in the league, The Citadel’s Homecoming will feature an offense that will accumulate less than 140 yards of total offense, average about 2 yards per play, and won’t score. I don’t think it will be that bad, but it’s hard to find much to be encouraged about, at least offensively (the defense has played fairly well over the last month, certainly well enough for the Bulldogs to have won SoCon games if the offense had been competent). Turnovers have been the headline problem, of course, but another issue is that the Bulldogs aren’t making big plays in the offense. 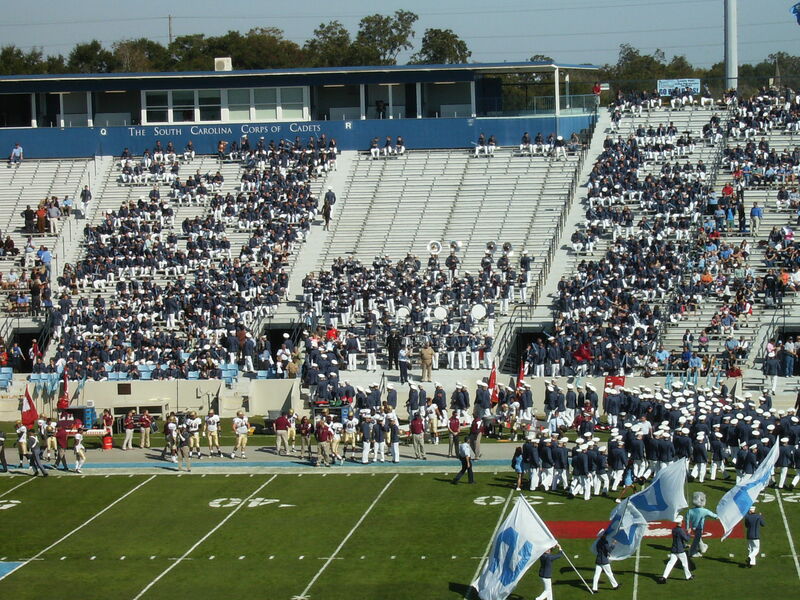 One reason The Citadel has scored only five touchdowns in six conference games is a lack of long-distance runs or passes. The Bulldogs only have had eight plays of 20+ yards in those six contests; only two of those plays were longer than 30 yards — and one of those two plays was a 33-yard run by punter Cass Couey, obviously not a product of the option offense. The Bulldogs have had nine drives of greater than 50 yards in league play. Four of those nine came against Furman in the conference opener. None came in the last two games. Incidentally, of those nine 50+ yard drives, Matt Thompson was the quarterback for five of them, Sam Martin the QB for the other four. 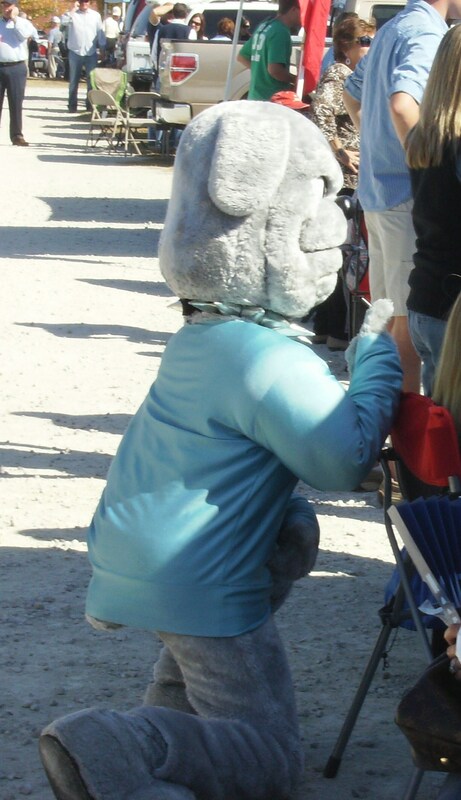 I would like to think the Bulldogs will give a spirited performance for the Homecoming crowd. 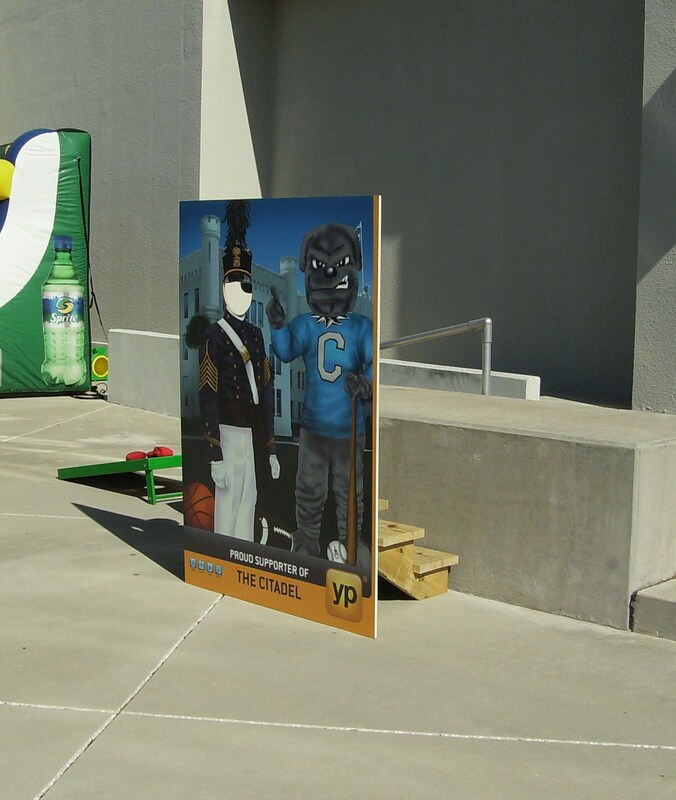 That didn’t happen last season, when The Citadel lost 43-17 to Wofford in a very poor showing that greatly disappointed the alumni. The year before, the Bulldogs narrowly averted a horrific loss at Homecoming to a terrible Chattanooga team. The Mocs were in the process of mailing in their season under a lame-duck coach, but The Citadel needed last-minute heroics from Andre Roberts to escape with a 24-21 victory. This year’s Homecoming game has been designated as a “Red Out”. There are two reasons for this, in my opinion. The official reason is to commemorate the return of “Big Red”. The other (and this is just my opinion) is to take advantage of the largest crowd of the season and sell a bunch of “Big Red” merchandise. That crowd size has to be the only reason the administration would have considered having a “Red Out” for a game in which the opponent is Elon, whose primary school color is…red. At least, I hope that’s the only reason. It still strikes me as not being a wise decision, and I know I’m not the only one. The effort to promote Big Red apparently will also include red jerseys for the football team, if the rumors are true (and I’m sure they are). There will also be a special Homecoming helmet design (see post #40 on this thread from TCISN), which is basically a remake of the Tampa Bay Buccaneers’ helmets. Not bad, but not innovative or particularly interesting. 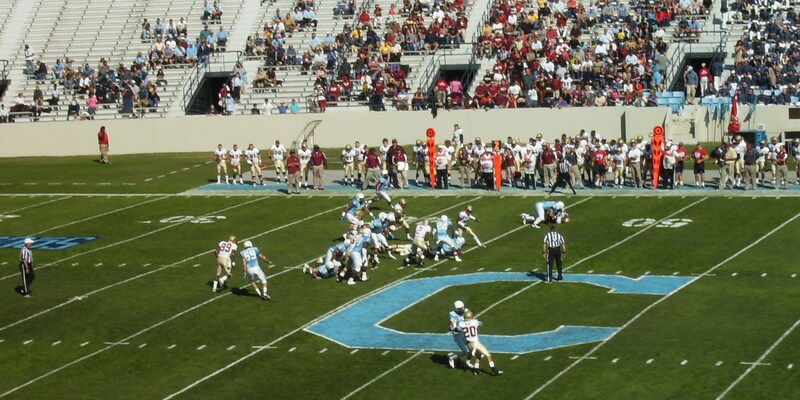 If The Citadel does indeed don red jerseys against Elon, that will mean the Bulldogs would not have worn the traditional home color combo of light blue jerseys/white pants for any home game this season. I guess at this point our traditional colors are now alternate colors, and the alternate uniforms are the “main” uniforms. 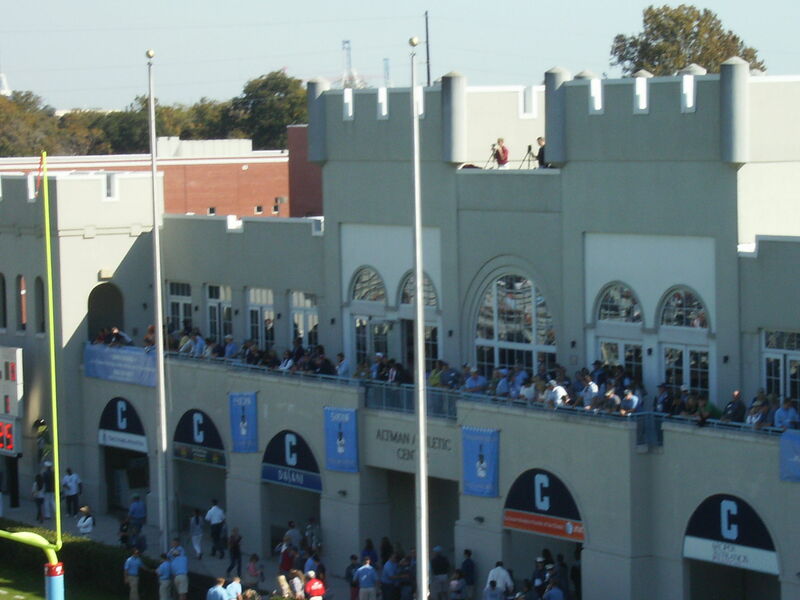 One thing I’m unfortunately fairly confident about: if The Citadel does wear red jerseys on Saturday, the jerseys will have “CITADEL” on the front, and not “THE CITADEL”. That, of course, is true for all the other jerseys the Bulldogs have worn this year, regardless of color. I assume it’s a cost-saving issue, as having the “THE” on the jersey would undoubtedly cost the school hundreds of thousands of dollars. This is one of my more cynical and less positive posts, and so the fact it’s also one of my shorter game previews is probably just as well. That said, I am hoping to be pleasantly surprised on Saturday. For one thing, it’s time for a little payback as far as Elon is concerned. 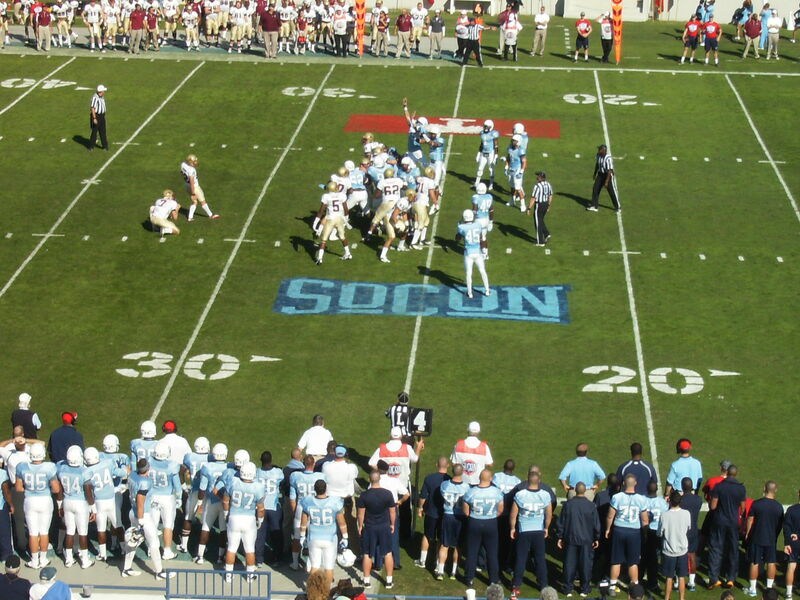 The Phoenix’s last visit to Johnson Hagood Stadium (in 2008) was a victory for the visitors, one basically handed to Elon by inept Southern Conference officiating. Quarterback Scott Riddle may not start for Elon due to injury. You may remember the last time Riddle started something against The Citadel; he ran away before finishing it, though. I’m not expecting a brawl on Saturday. I do want to see some fight in the Bulldogs, though. 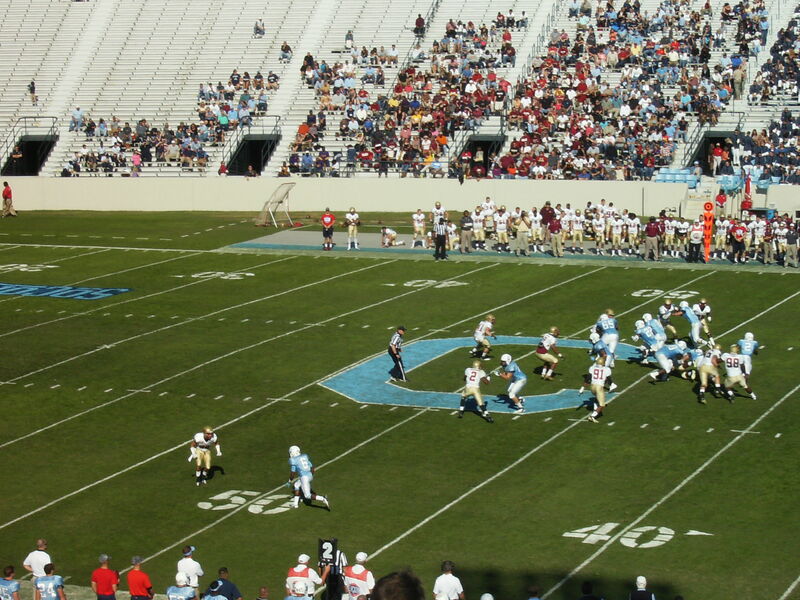 During the game, SportSouth played a clip of The Citadel Regimental Band playing at the 2010 Royal Edinburgh Military Tattoo. It was easily the highlight of the telecast for The Citadel. Sam Wyche struggled trying to come up with a positive for the Bulldogs. 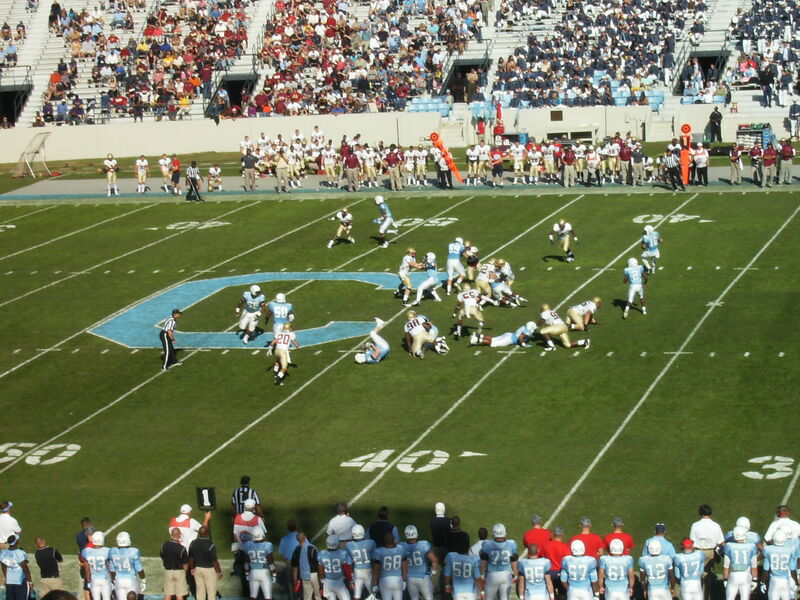 At one point, he noted that The Citadel had cut its turnovers in half from the week before. When the best thing that can be said about your offense is that it didn’t commit nine turnovers in consecutive weeks, your offense has issues. 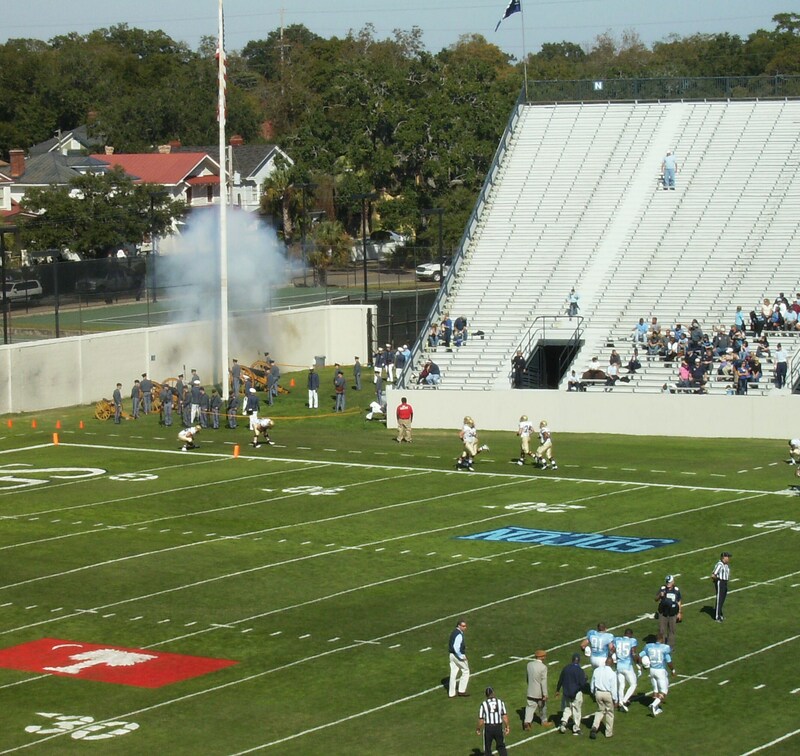 The Citadel has been shut out in consecutive games for the first time in a decade. In case you were wondering, the last time the Bulldogs were shut out three times in a row was 1953, when The Citadel actually suffered four straight shutout losses. I would say that if the Bulldogs can’t put a crooked number on the board against Elon on Homecoming, it’s going to get ugly, but the fact is that it’s already ugly. 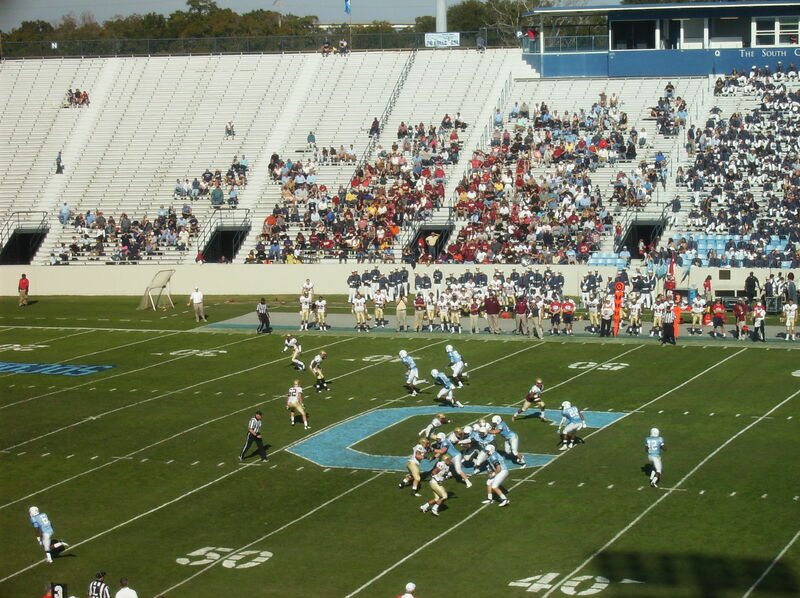 Not only have the Bulldogs been shut out twice in succession, in neither game did The Citadel snap the ball in the opponent’s “red zone”. 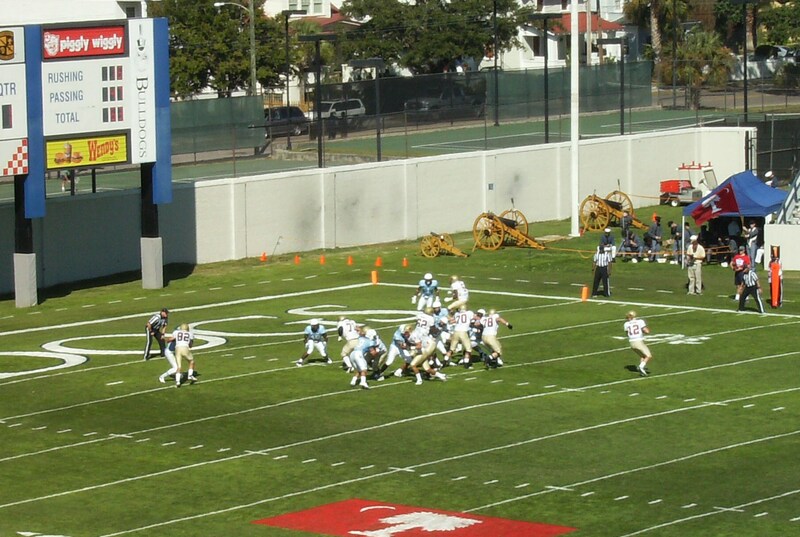 The closest the Bulldogs have come to the opposing end zone in the last two games? 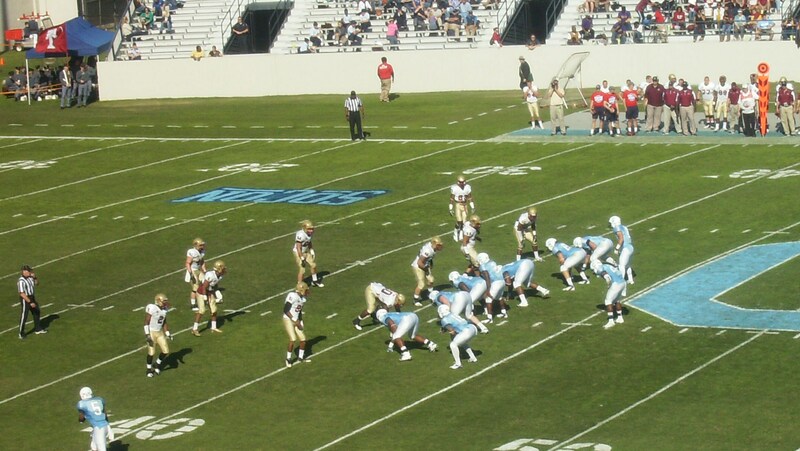 In the Georgia Southern game, The Citadel reached the GSU 23-yard line before fumbling. 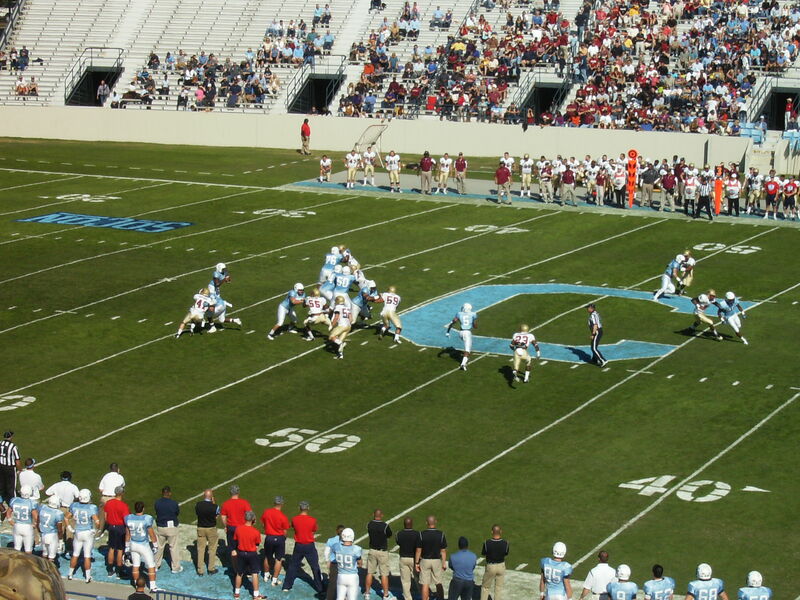 Against Wofford, the deepest penetration was the Terrier 38-yard line, which is where The Citadel was when the game ended. I didn’t understand why the Bulldogs did not make an effort to run more plays at the game’s end, to be honest. 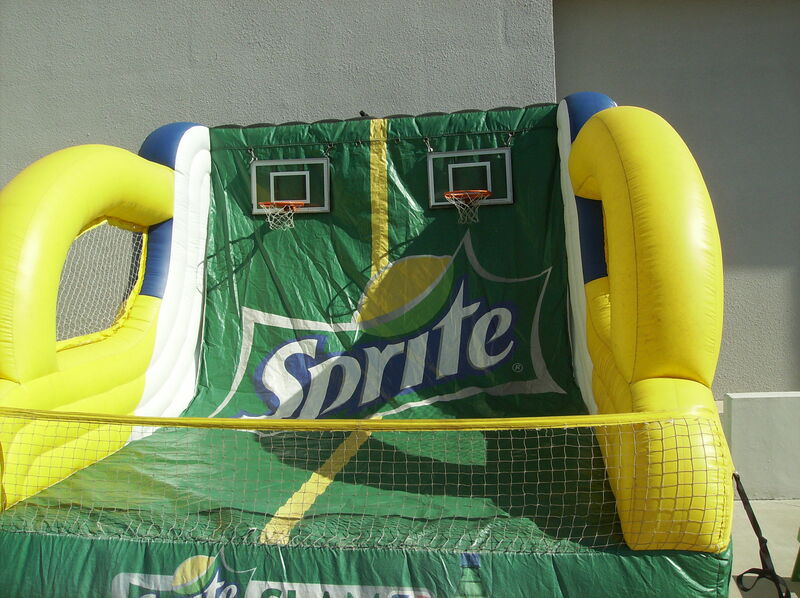 Why not at least try to score? What did they have to lose? I was disappointed in that. The Bulldogs also put freshman Ben Dupree in at quarterback for the first time since the season opener against Chowan. Dupree, who had been playing at slotback, ran nine times for a net of three yards. I’ve got to ask…if he has been breaking “one or two for 50-plus yards” in practice, why wasn’t he put in the game at quarterback in other games? Is there any particular reason a potential big-play threat wouldn’t have been useful against Georgia Southern, or Chattanooga, or Western Carolina? The quarterback rotation in the game against Wofford was curious. Matt Thompson started, was replaced by Dupree, who was replaced by Thompson, who gave way to Sam Martin. This might not be exactly right, so I apologize if I’m off by a play or two, but I think the rotation went like this: Thompson for two series (six plays), followed by Dupree for three series (fifteen plays), followed by Thompson for seven series (twenty-five plays), followed by Martin for two series (sixteen plays). 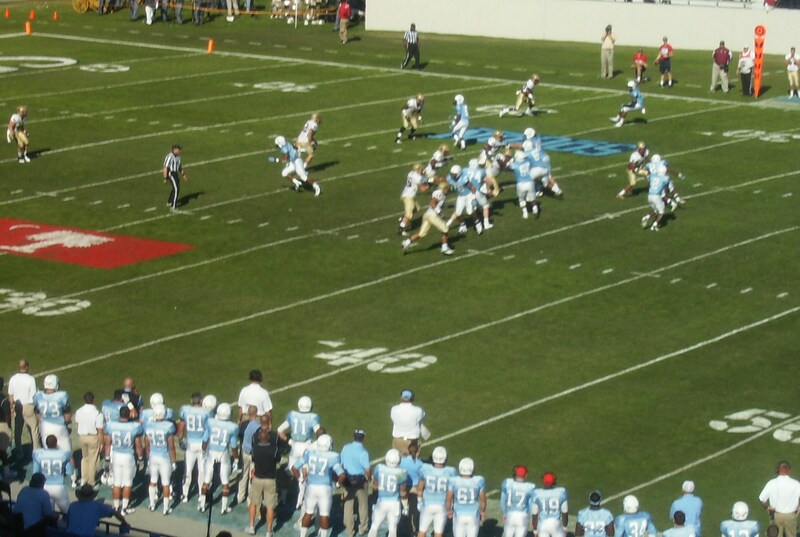 The Citadel managed only 143 yards of total offense. About half of that came during the last two series of the contest; Martin was in the game for both. That’s not to say he was necessarily playing better than the other two quarterbacks (after all, Wofford wasn’t playing many of its starters by that time), but the team did move the ball a little bit when he was in the game. The defense turned in a respectable performance. It did allow two long scoring drives, but otherwise held up its end of the bargain. It has to be tough to constantly defend on your side of the field. Wofford’s average starting position on its offensive possessions was its own 44-yard line (although that’s better than last week, when GSU’s average drive started on The Citadel’s 40-yard line). Eric Clanton and Tolu Akindele were noticeably active (Akindele forced two fumbles). Rod Harland led the team with ten tackles. Everyone knew this wasn’t going to be the easiest of seasons, not with the transition to the triple option offense. I think what is most frustrating, though, is that Bulldog fans really haven’t seen that much of the triple option in action. Instead, they’ve seen constant problems with the exchanges between the quarterback and the center, and the quarterback and the fullback. It’s as if the play never develops, and the result is the quarterback being tackled for a three-yard loss, or a fumble, or both. 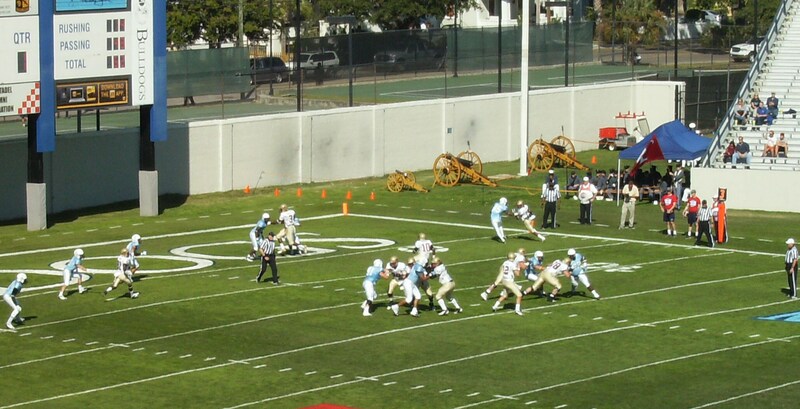 In addition, when The Citadel attempts a pass it is more often than not a “cover your eyes” situation. On to Elon. It’s Homecoming. 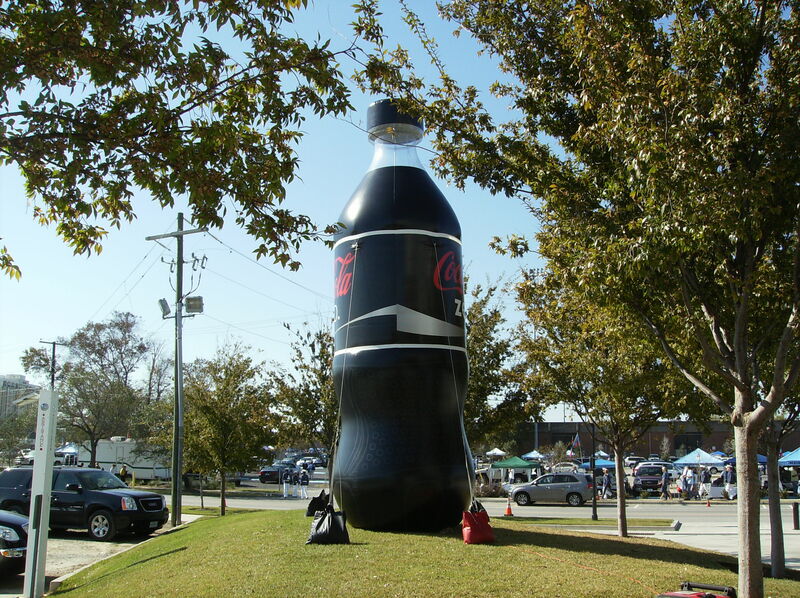 My advice to alums returning for their reunions: concentrate on the tailgating. 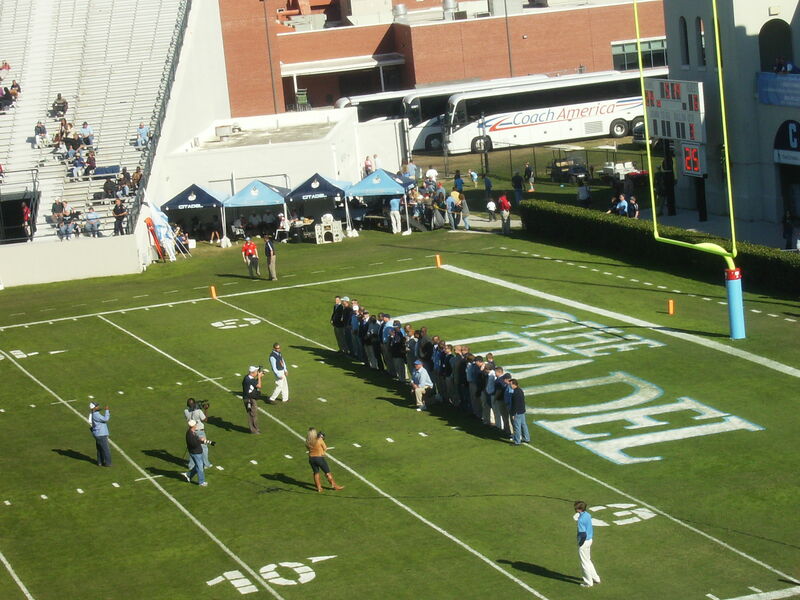 The Bulldogs return to Johnson Hagood Stadium for a 1:00 pm ET game against the Eagles. First, though, a few thoughts on the Appalachian State game, since I didn’t post a review of that contest. All of that came on the road, against the #1 ranked team in FCS football. So how exactly did The Citadel only lose by 29 points? Okay, so maybe I had to stretch to come up with some of those positives, but I guess my final analysis of the game would go something like this: it could have been worse. Hey, the Mountaineers are ranked #1; the Bulldogs are not. 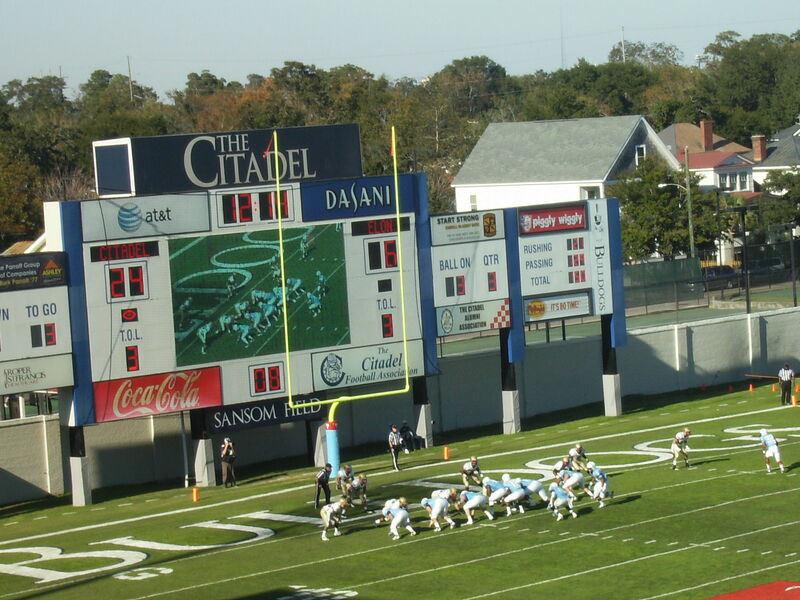 It was never going to be a game for The Citadel to use in measuring its progress this season. On the other hand, Saturday’s game against Georgia Southern is such a game. Prior to this season, Jeff Monken had spent the past 13 years as an assistant for Paul Johnson at three different schools — Georgia Southern, Navy, and Georgia Tech. (Monken was also a grad assistant at Hawai’i when Johnson was the offensive coordinator there.) He was hired by GSU to restore the triple option, and with it the glory days of Eagle football. “Who cares about transition years? Nobody cares about that. We want to win. I want to win, our fans want to win, our kids want to win. Nobody wants to hear about transition, or we’re young, or we’re learning. That’s a bunch of talk. Contrast that with The Citadel, where most (although by no means all) fans are content to allow Kevin Higgins a “transition year” in the sixth season of his tenure at the military college. Of course, Monken knows that he has a little more leeway than what he expressed in the above quote. Georgia Southern fans aren’t expecting him to compete for the national title this year. There are also those GSU supporters who aren’t that interested in the FCS national crown, because they would rather see the program move up to FBS land. I think that would be a mistake, at least as things are currently constituted in the two sub-divisions. I wrote about this last year, when GSU released its study on the issue. Of course, now Appalachian State has decided it’s also going to study the pros and cons of making the move. It’s prudent to assess the landscape of college football, and I don’t blame either school for investigating their options. It’s my opinion, though, that unless there are major alterations in the world of FCS (or FBS), staying put is the way to go for the folks in Boone and Statesboro. Georgia Southern is 3-3, 1-2 in the SoCon. It looked for a while like Monken was ahead of schedule, for going into the game against Wofford the Eagles were 3-1 and ranked in the FCS Coaches Poll. However, a home loss to the Terriers was followed by last week’s setback at Chattanooga, and it’s clear that it’s not yet smooth sailing for GSU in conference play. 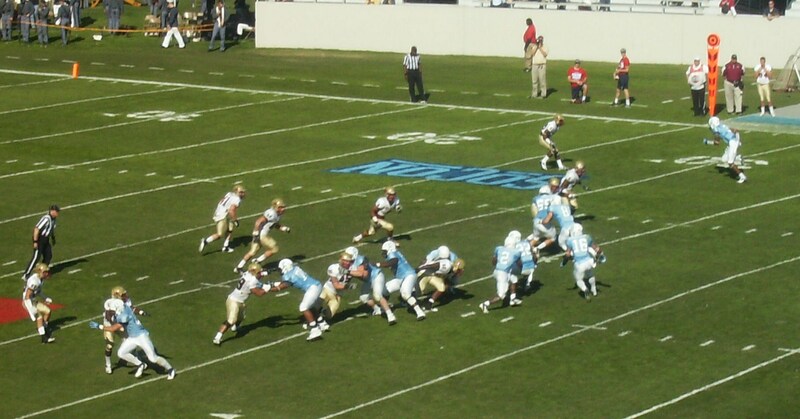 The biggest advantage Georgia Southern has had over The Citadel in re-instituting the triple option has been at quarterback, where the Eagles can rely on Georgia Tech transfer Jaybo Shaw, who not only ran the offense at Tech, but also ran it in high school. He’s not an explosive runner, but he can make all the reads and can also throw the ball fairly well (10.3 yards per pass attempt; 4 TDs, no INTs). GSU is averaging 4.9 yards per rush. J.J. Wilcox is a solid slotback who can also catch the ball (his eleven receptions leads the team). Robert Brown is a freshman fullback who actually leads the Eagles in rushing, but he’s been hurt. There is no Adrian Peterson (GSU version, not Oklahoma version) suiting up this year for GSU. Wilcox is the only GSU player with more than 95 receiving yards (he has 302). No other Eagle has more than six grabs, but when one does make a catch, it’s usually for a good gain. GSU receivers are averaging 19.1 yards per reception. Georgia Southern has a young-ish offensive line (three juniors, a sophomore, and a freshman), and it’s been a little inconsistent. While the Eagles are fourth nationally in rushing offense, they have suffered eleven sacks, which is a lot for a team that doesn’t throw the ball too often. On defense, the Eagles are led by Brent Russell, an interior lineman with 4.5 sacks, three other tackles for loss, and two pass breakups. He’s a very good player. Other than Russell, though, GSU is not particularly sack-happy, with 12 total sacks on the year. Georgia Southern has a solid, if not dynamic, group of linebackers and an improved secondary, although one with a tendency to give up the big play (five TD passes allowed of greater than 25 yards). Does that sound familiar? Georgia Southern’s special teams have been outstanding. Placekicker Adrian Mora has not missed a field goal or extra point this season. He hasn’t been asked to kick long FGs (his longest this year is 41 yards) but he has made all that he has tried. Punter Charlie Edwards is the key factor behind the Eagles’ excellent net punting average of 39 yards, fourth in the country. Georgia Southern’s 3-1 start included a game at Navy. GSU lost that game, but only by a 13-7 margin. Considering it was a battle of triple option teams, both with Paul Johnson connections, I thought it was interesting that the game was low scoring. 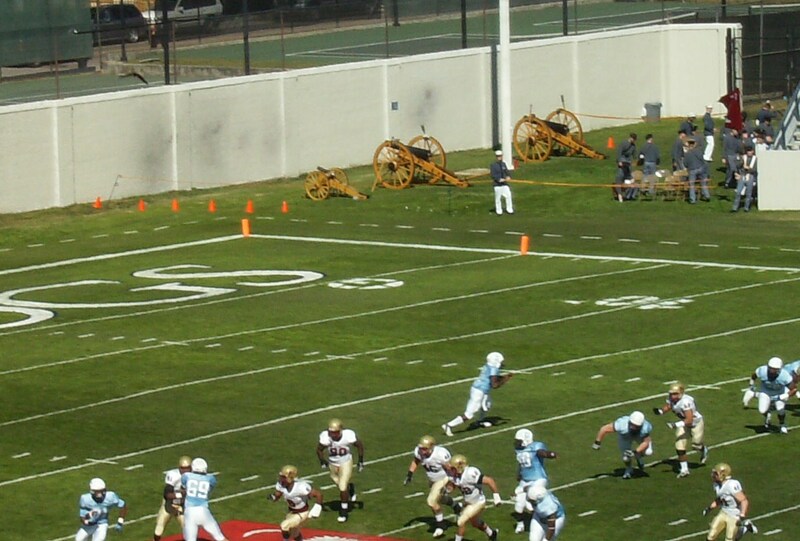 The Citadel is also running a similar triple option system, of course. Will the Eagles defend the same way against the Bulldogs? And how exactly did they defend, anyway? Question: I read that GSU defended the option in part by using its corners more aggressively (“firing the corners”) than is the norm. Is that correct? Answer: The best way to defend firing corners is just to block. It’s not an uncommon move; Air Force, Wake Forest, and SMU did it too. The difference between the wins and the losses was personnel, specifically the slotbacks. One of our junior slotbacks who was injured to start the year came back against Wake Forest, and all of a sudden it was no longer a problem. Question: Would the passing game be one way to combat that? Specifically, throwing the ball to a slotback, or maybe even the fullback (on a screen pass)? Answer: There are ways to beat it in the passing game too. The simplest way is to just throw to the uncovered receiver. I think there’s a video of that in the Air Force writeup. The cornerback blitz is as vulnerable to screen passes as any other blitz, and Navy runs a screen to the fullback in the direction of the blitz on occasion. The wheel-post works really well against blitzing corners too. Georgia Southern’s staff knew the Navy staff’s hand signals, so Navy had to stop going no-huddle early on. Brent Russell also played a very good game. Question: Any thoughts on their splits? Answer: GSU’s splits are wider than Navy’s. There was a rule enacted last year that prohibited anyone lined up outside the tackles from blocking below the waist back inside the tackle box. That’s why Navy’s slots line up with their inside foot inside the outside foot of the tackle. GSU doesn’t bother having their slots cut block inside anymore, preferring to keep the formation more spread. Thanks again to The Birddog for answering my (probably simpleminded) questions. 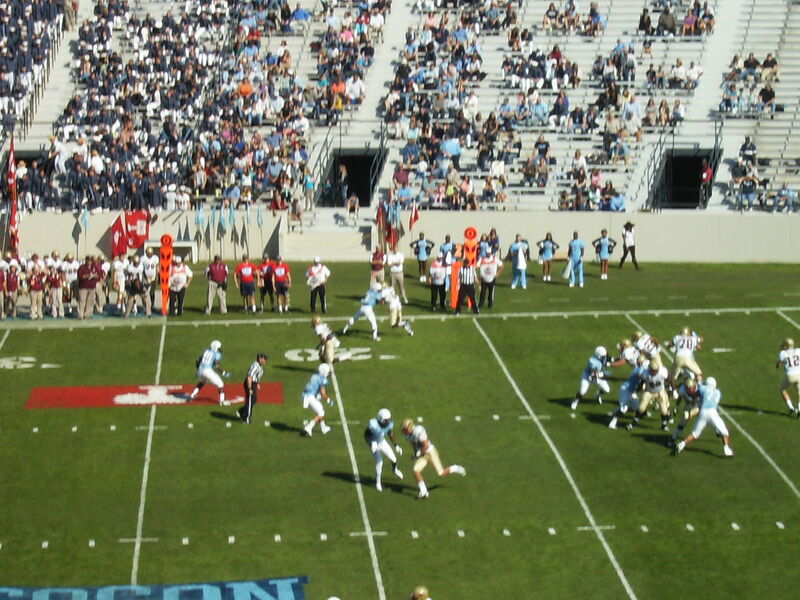 The passing game has been a sore spot for The Citadel this year, of course, so the notion that being able to successfully throw the ball against GSU’s defense might be a key to the game probably makes Bulldog fans a little queasy. 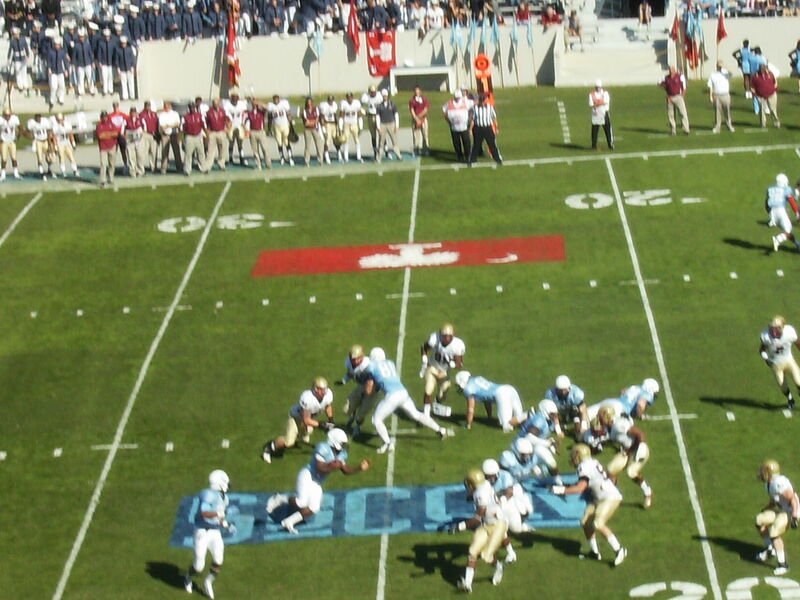 The Bulldog slotbacks also must block well; perimeter blocking has been an issue for The Citadel all season. …the Bulldogs have to get some semblance of a throwing game in shape before Georgia Southern brings its version of the double-slot option to Johnson Hagood Stadium on Saturday. Coach Kevin Higgins said Monday that offensive coaches will simplify their passing schemes this week in order to do just that. “One thing we talked about as a staff (Monday) morning is simplifying what we are doing,” Higgins said at his weekly news conference. “Last week, we carried in 30 to 36 passing plays that you practice on a routine basis, based on what you might see in a game. At this point, I think we have a good idea of what our opponents will be running. Now, in my mind, we’ve got to get that 36 down to 10 or 15 plays. Hartsell also pointed out later in the story that the better you are at running the ball in the TO, the easier it is to pass it. It should be a nice day for a game on Saturday in Charleston, with sunny skies and temperatures in the mid-70s. 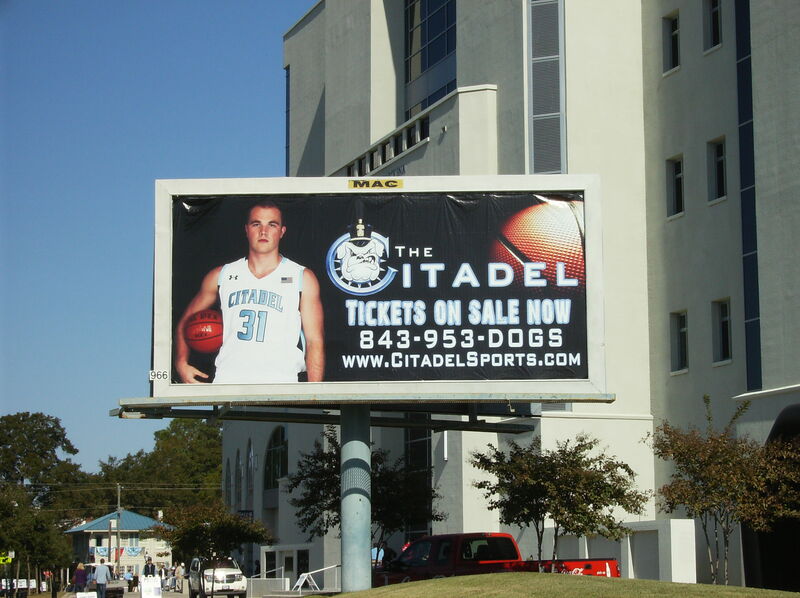 Let’s hope that the sun finally shines on The Citadel in conference play.